Strange Labyrinth. 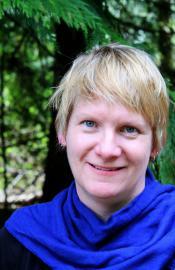 Kat Cameron. Oolichan Books. Fergie, British Columbia. 2014. Kat Cameron reads twice her age, how else to explain the kaleidoscopic range of her cultural, historical and literary references where she tips her hat, says "how do you do?" to a myriad of misfits and heroes, markers. Today's book of poetry was on side from the start. 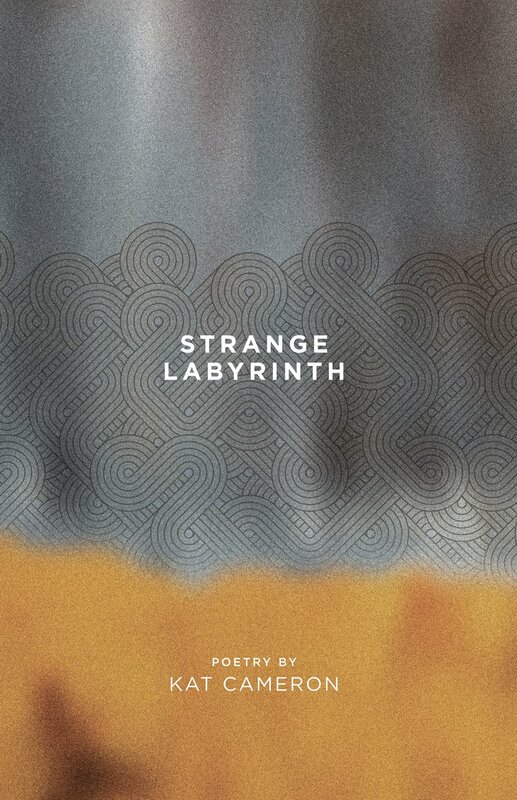 Strange Labyrinth is as advertised, we enter some strange territory and the exit isn't always certain but Cameron's curiosity and interests have a large span. And the reader never feels lost. Cameron creates poems that have emotional certainty at the heart of them as though they arrived fully formed and knowing which way to lean into the wind. This rock slide destroyed one side of Mount indefatigable. Frozen waves, aeons buried in the cresting line. snow-ghosts climb, flint heels striking fire from shale. Ammonites spiral time in twisted coils. Queen Anne's lace, float by bristling blots of red paintbrush. The air is thin, three thousand feet above the far earth's floor. Marmots whistle warnings on the wind. Today's book of poetry hears echoes of Saint Earle of Birney and his beautiful "David" in "The Palliser Slide," if only a frisson. Cameron's nature capture has the same reverent awe, she makes the panorama present right there on the page. Cameron works a whole magical lode of tenderness into her Strange Labyrinth. Today's book of poetry doesn't want to give away any secrets but Kat the C has a thing for Mary Shelley's monster. e.e. cummings, Byron, Sylvia Plath, Elizabeth Bishop, Eliot, Pound and Vincent the Goth Van Gogh all show up, Marcus Aurelius and his Meditations sharpen Cameron's tools. Strange Labyrinth brims with smart lyric animations and host of glamorous accomplices. Today's book of poetry doesn't want to give the wrong impression, Kat Cameron's earthy poems aren't inhabited by or about the above mentioned iconic figures. They are all just along for the ride. Cameron is writing about this world and our place in it, the space women inhabit that men don't know about. dishwater and lotion, spent the day tapping staccato keys. from the fence, like shreds of forgotten sunsets. narcissi, and clusters of purple crocuses. feeling the soft dirt crumble with promises. Our regular early morning read here at Today's book of poetry was a bit dishevelled today. I have recently spent a few days working out in the real world with real people. Once in a while I get work at the Art Bank and it is one of my favourite places on earth. Picture a large warehouse carefully packed with around 20,000 works of the best contemporary Canadian art. It's a dreamland. I worked as an Art Technician for many years, transporting and installing art work. In recent years I've worked mostly in the Frame Shop. It is work I thoroughly enjoy. So my brain and tired old posterior has been toiling hard at the Art Bank. When I haven't been at the Art Bank I've been in David Lee world. David Lee is a poet from Texas who now lives in Utah. Our St. Louis correspondent, Mark Twang, sent us a couple of David Lee's books along with a Copper Canyon Press CD with David Lee Reading from A Legacy of Shadows and News from Down to the Cafe. Today's book of poetry will be dealing with Mr. Lee in the near future but I've been making the staff listen to his CD non-stop for the last couple of days. Now everyone around here is running around with a David Lee accent. Beer bottle on their hip. The other good, but distracting, news is that the sun is out. It really does feel like spring and when that happens most of us here in Ottawa get a little sun drunk. Everyone in town will be out on patios and in shorts by noon. For all I know it could snow again tonight. So our morning read was slightly distracted, we opened all the doors and windows for the first time since October. Kathryn, our Jr. Editor, made sure that we all cottoned onto the strong feminist voice that inhabits these poems. Cameron isn't burning down the house with strident polemics, she's informing the house because they need to know. Once Kathryn laid down the law Kat Cameron's poems worked their way around the room, humour popped out when we least expected it, along with Frankenstein, Cameron kept us well entertained. Kat Cameron's Strange Labyrinth isn't really so strange at all. These intelligent poems "examine the choices women make," flirt joyously with strange dancers, summon memory. Strange Labyrinth is a powerful debut. Today's book of poetry will be anxious to see more from Kat Cameron.